Home maintenance tasks are easy to forget. We take our dryers, smoke detectors, and roofs for granted until there is a problem. When done regularly, these three home maintenance tasks will save you money in the long run. Periodically cleaning your dryer duct helps your dryer work more efficiently. When properly maintained, a standard load should take about 45 minutes to dry. You’ll save an average of $20 a month on your utility bill by cleaning out the duct. More importantly, accumulated lint in the duct is a fire risk. Around 2,900 dryer fires are reported every year. Save yourself from the risk of a house fire and cost of smoke and fire repair with this simple task. A dryer vent brush. Hardware and home improvement stores sell brushes that extend up to 12 feet starting at $20. Another common length is 20 feet. Make sure you buy one long enough for your duct. Have your vacuum and broom handy. If you haven’t cleaned your vents out recently, expect a lot of lint. How often you clean your dryer vent depends on how much you use your dryer. At a minimum, you should do this at least once a year. 2. Disconnect the vent pipe. 3. Locate the exterior vent. 4. Begin cleaning at the duct’s highest point. If your dryer is in the basement, your vent is likely outside just above ground level. Start outside and push the lint down in the basement, letting gravity help you clean. If you opt to have dryer vent cleaning done by a professional, expect it to cost around $130. Dead batteries cause 25% of smoke alarm failures. Of home fires that resulted in fatalities, 40% had no smoke alarms, and 17% had no working smoke alarms. Test all of the smoke detectors in your home monthly. This ensures that the detector is in good working order and the batteries aren’t dead. Most smoke detectors “chirp” or “beep” when the battery is running low. But even if everything looks good with your batteries, they should still be replaced once a year. A good reminder to replace the batteries is when daylight savings time ends. You should replace smoke detectors every 10 years since they become less sensitive over time. Smoke detectors should have the manufacture date stamped on the back. If you are unsure of how old your smoke detector is, it is well worth the money to replace it. Basic smoke detectors start at $12. Think of your gutters as a front line of defense against expensive water damage. When not cleaned regularly, clogged gutters allow water to pool on your roof and leak or overflow. Not only does this risk damaging your roof, but dripping water can cause flooding below and ruin the interior or foundation of your home. Your roof is one of the most expensive components of your house. Replacing a roof averages about $7,600, but can be much more than that depending on the size of your house and materials used. The cost of roof repairs averages about $800. Gutters should be cleaned twice a year. If a lot of trees surround your house, you may need to do it more often, especially in leaf-shedding season. If you’re comfortable getting on a ladder, this is a cheap and easy DIY project that costs only your time and maybe the price of a pair of gloves. If you would rather have your gutters professionally cleaned, you’re looking at a price of about $100 to $200. The key to home maintenance tasks is performing them on a schedule. 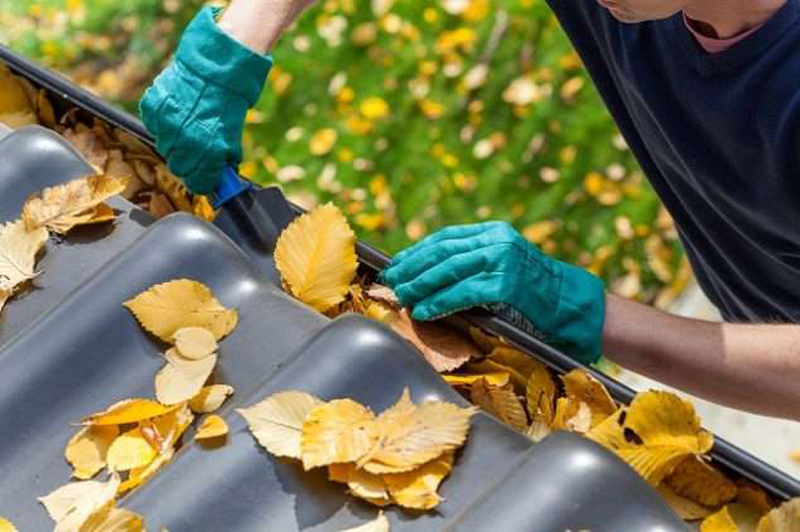 Many tasks make sense to do with the change of seasons, like cleaning gutters and dryer ducts. Whenever you choose to do it, routine maintenance helps you avoid emergencies and costly repairs.